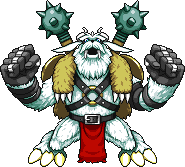 A Beast Man-type Ultimate Digimon which governs the freezing lands of the permafrost, where nothing ever thaws. 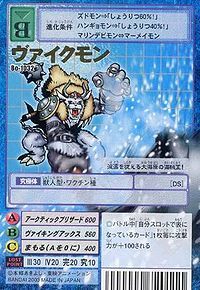 Its fur has become like ice crystals, and is said to be as hard as Chrome Digizoid. With the morning star "Mjöllnir" it carries on its back, it can annihilate a mountain in one swing, distorting space itself. 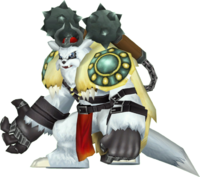 It manages the Ikkakumon and Zudomon corps, and though in the midst of battle it appears as a heartless berserker, it shows a face of great compassion for its subordinates. 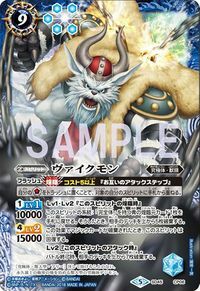 Its Special Move "Arctic Blizzard" momentarily brings the surrounding atmosphere to absolute zero, flash-freezing the opponent, who it then smashes with Mjöllnir. That the opponent's smashed body becomes like a blizzard is what gave it the name. 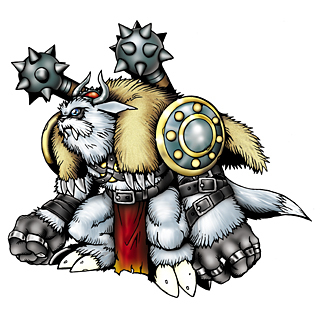 A Beast Man-type Ultimate Digimon which governs the freezing lands of the permafrost, where nothing ever thaws. 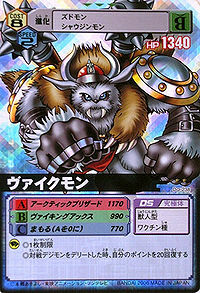 Its fur has become like ice crystals, and is said to be as hard as Chrome Digizoid. 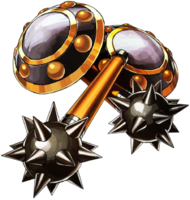 With the morning star "Mjöllnir" it carries on its back, it can annihilate a mountain in one swing, distorting space itself. n., Misspelling of vik, written to indicate the long i (ī) vowel sound, from viking. 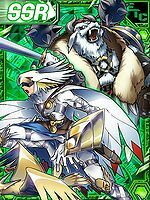 Anime/Manga Digimon Adventure V-Tamer 01: "Hot Blooded!! The Great Sparkling Battle!!!" Momentarily brings the surrounding atmosphere to absolute zero, then smashes the frozen enemy with Mjöllnir. Fires its morning stars on long chains, or slams a glowing fist down on the enemy. 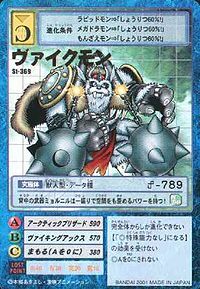 Viking Flail  ヴァイキングフレイル Vaikingu Fureiru Viking Flare Uses the morning star on its back to unleash a powerful blow. 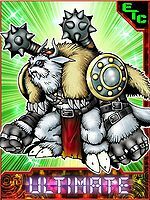 Berserk Howl  ベルセルクハウル Beruseruku Hauru Bazooka Howl/Bazzoka Howl Howls with all of its berserker rage. Uses the morning star on its back to unleash powerful hits. Raises its defense with a roar and a white aura. Strikes with its icy morning stars. 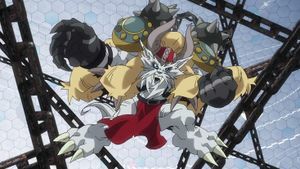 Vikemon from Digimon Adventure tri. 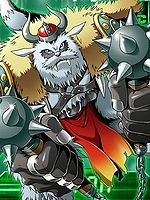 Vikemon is Kido Jo's Partner Digimon. 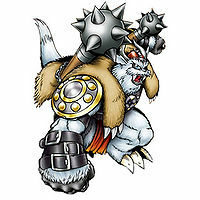 Gomamon takes this form in "Determination", to fight Imperialdramon. 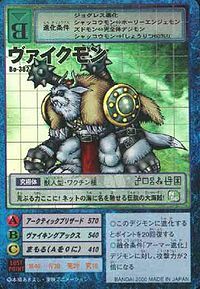 Vikemon is the Partner Digimon of Hida Iori and Ultimate form of Armadimon. 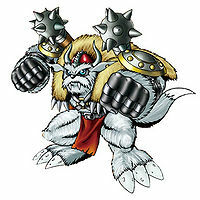 Vikemon is an enemy Digimon. 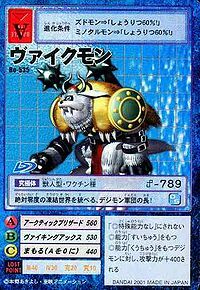 Can be evolved from Zudomon if above level 53 and Water EXP above 9000. 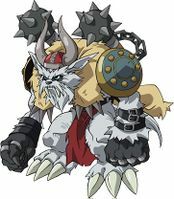 Vikemon is an obtainable Digimon which is evolved from Monzaemon or Zudomon. It can also be obtained as a collectible card. 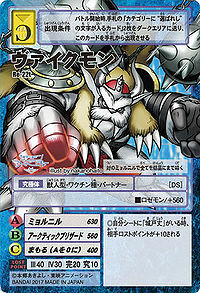 Its card is part of the Gomamon Evolution (ゴマモン進化 Gomamon Shinka) set. Vikemon is the partner of Kido Jo. Vikemon can be encountered at the Tokyo Metropolitan Office. It evolves from Shakkoumon, Zudomon, and Tonosama Gekomon at level 50 with 1,700 HP, 130 ATK, 130 DEF, 120 INT, and 20 ABI. It is also available as a Digimon Medal. The weapon on its back, Mjöllnir, has the power to warp even space-time in one swing! The power of wildness lies here! This great, legendary pirate is famous throughout the Net Ocean! Leading an army of Digimon, it rules over a frozen world of absolute zero! This pirate king of the great ocean is accompanied by the surging sea! Using its twin Mjöllnir, it smashes all into fragments of crystal. 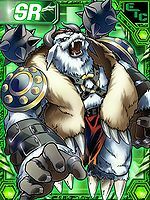 A Beast Man-type Ultimate Digimon which governs the freezing lands of the permafrost. This page was last modified on 13 March 2019, at 03:53.